I'm so excited for this post because the tarttelette palette is finally here! A few months back when the Holiday Collections just hit the Malaysia's market I found on Tarte FB that they will be launching the Spring 2015 Collection which called Tartelette. And of course the first thing that caught my eyes was the Tartelette eye shadow palette. 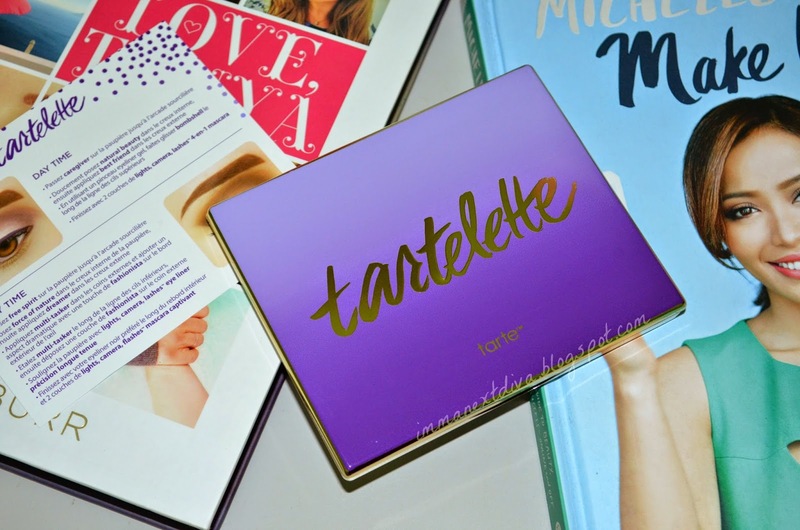 I never tried any Tarte eye shadow before, so I'm really excited to try out this palette. Let's talk about the packaging design,it is nothing but gorgeous. The gradient purple with gold color basically represent Tarte! Always love how they put effort to make the design simple but still eye catching. Very nice. But somehow I have mixed feeling about the packaging itself. It feels so plactic-y like my SimplySiti eye shadow palette. It feels cheap and make me questioned is it really worth the price. 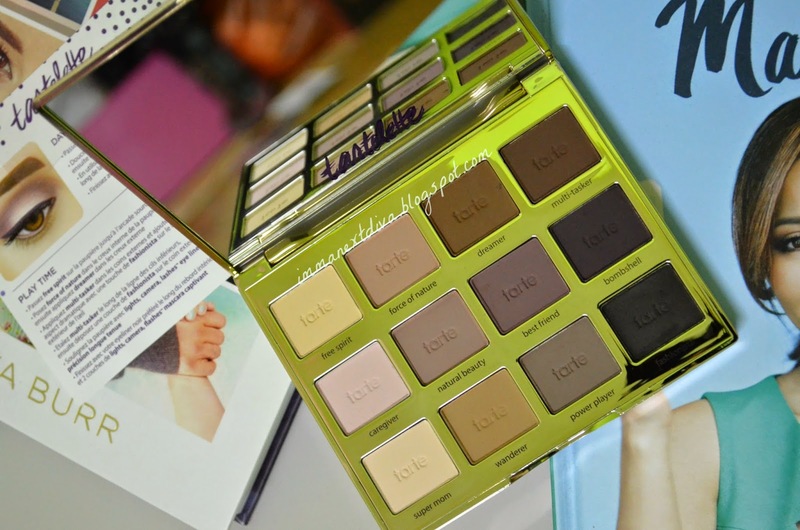 In the inside, this palette comes with a large mirror which I find it very helpful and a cute Tartelette design printed on the mirror. This palette contains all matte eye shadows. Comes in 12 different colors which suit almost all skin colors. I find this palette very versatile because it has all the colors that every skin tones would need. From fairly light color, to mauvy toned, and to deep brown toned and not to forget a black color. For the price of RM175 all you have is this palette,that is it. For the beginner this is a little way too expensive if you are completely from the very bottom where you don't even have you own brushes or makeup tools.As usual I always compare palettes with Urban Decay palette which I found they are one of the most practical palettes(always come with a handy brush or brushes and an eye primer. WINNER!). If you ask yourself, do you really need this palette? Let's put yourself in the situation where you are an absolute beginner in makeup and you are too afraid to playing with shimmering and glittering eye shadow. Second situation where you are a matured women who are into simplicity and love to put color to your face just to enhance certain features of your face. Third situation if you are dying to find the perfect transition and matte highlight shades for your eyes. Or you want to extra practice in blending shadow. Next one, you just love matte eye shadows. If you are fall under any of these categories, then this palette is definitely for you. So the question is, would you buy this palette? Do you really into wearing all-matte eye shadows? I had my eye on this palette yet I have decided to skip it thought i love matte shadows. I already got so many neutrals need to use them up :) and you are right its a bit pricey as well :) Nice review. i really look forward to this plaette, one f the reason is each shade inspire from my favourite you tubers.. aaaa i'm excited! glad it is not limited edition. Is it? I thought it is one of the spring collections. Well that is a very good news.